Cancer in the News – What to Think, What to Believe? Cancer has been in the news a lot recently. In the last few days, there have been separate reports in the newspapers about the high cost of some cancer drugs, and the prediction by a national charity that there will be a crisis of unmanageable proportions in the NHS due to the record number of people with cancer. 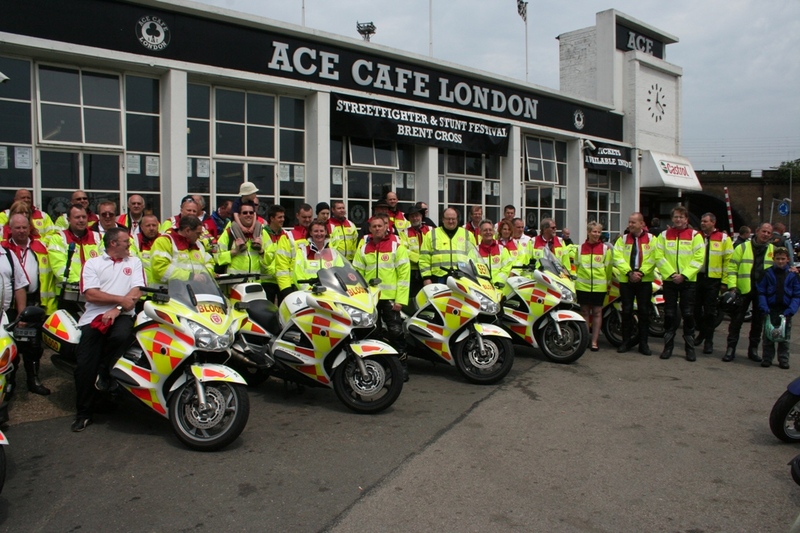 But there were two reports that appeared over the Christmas period that caught my eye. 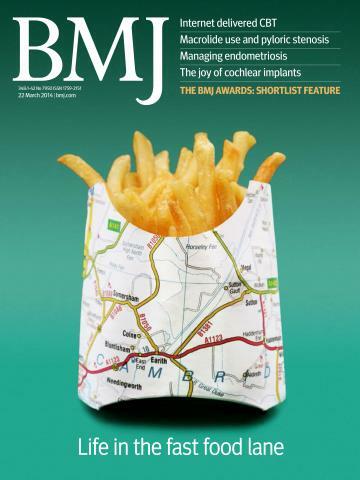 BMJ, the weekly journal of the British Medical Association, was first published in 1840 and is one of the world’s oldest general medical journals. The first was a story in The Independent (31 Dec 14) with the headline ‘Cancer is the best death – so don’t waste billions trying to cure it, says leading doctor’. The story originated from Dr Richard Smith, a former editor of BMJ (previously the British Medical Journal), who had argued that cancer allowed people to say goodbye and prepare for death and was therefore preferable to sudden death, death from organ failure, or ‘the long, slow death from dementia’ adding ‘let’s stop wasting billions trying to cure cancer, potentially leaving us to die a much more horrible death’. My initial reaction was to think that whilst having cancer in later life might to some be preferable to developing dementia, what of people who die of cancer much earlier in life: children and young persons, parents with young children, or just someone who happens not to even reached their 40s? What of people who die quite suddenly of cancer, within months rather than years? Another concern was about the drugs and treatments that alleviate the symptoms of cancer rather than cure it? Is it similarly misguided to incur these costs? With the prospect of us all living longer, the increasing cost of healthcare is a big challenge so perhaps Dr Smith was only joining the debate on how far can we fund these costs. 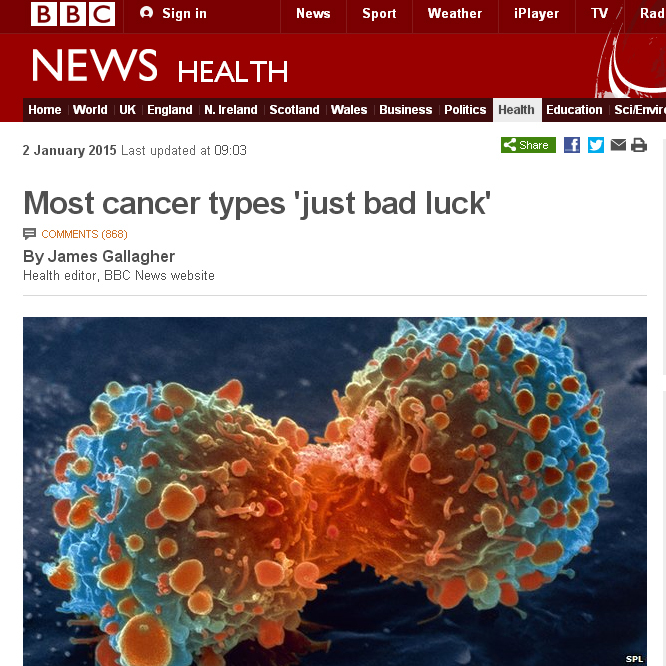 The second story, on the BBC News website (2 Jan 15), which had the headline ‘Most cancers types just bad luck’, came from American research, unspecified, saying that ‘new research has suggested that most types of cancer are the result of bad luck, rather than an unhealthy lifestyle or genetic factors’. My first thoughts was to question who had suggested that a large proportion of cancers were related to lifestyle anyway. Of more concern was the notion of ‘bad luck’ as if there was nothing we could do about it. I didn’t think that scientific research recognised bad luck. There is surely a mechanism, a cause, to everything in the natural world even if the processes are beyond the limits of our current knowledge. But perhaps I don’t know enough about random events. Further, I found myself thinking that if lifestyle wasn’t the cause of two-thirds of cancers, that perhaps lifestyle wasn’t relevant either in the treatment or survival of the disease. This would of course be nonsense. Keeping fit through regular exercise or healthy eating is a vital part of managing ill-health, including cancer. 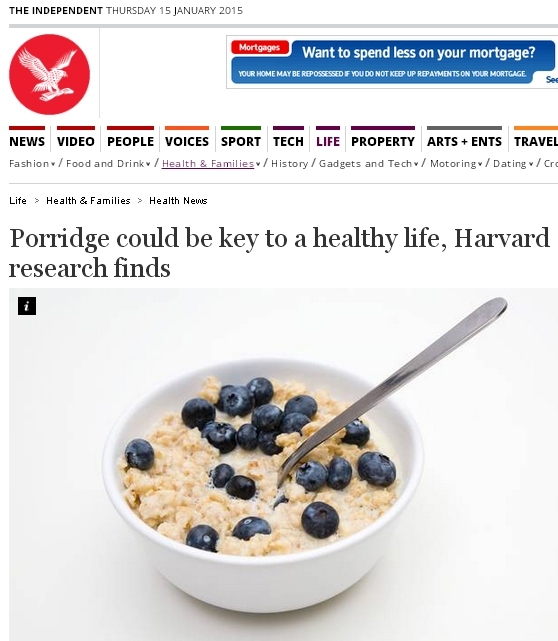 And this is so even if our knowledge of exactly what it is in particular foods that makes it a good food or a bad food is imperfectly understood, given the immense difficulty of scientifically trialling particular foods. I decided to look into the sources of these stories. How accurate was the reporting? Is the science behind the stories much more complicated than how they are presented? Are readers being misled?